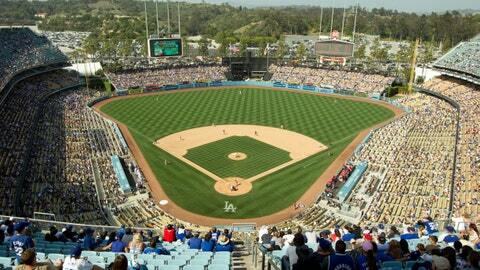 Dodger Stadium was visited by 3,743,527 fans during the 2013 season. Dodger Stadium is the third oldest ballpark in Major League Baseball. It’s also the most popular venue on social media. During the 2013 season, in which the Dodgers won the National League West and led the majors in attendance, Dodger Stadium was the most visited (3,743,527 fans) and most check-in sports venue in the United States, according to Facebook. The stadium was also fourth on the list of most checked-in locations in the U.S. in general, eighth best worldwide for Instragram and and third best in MLB for Twitter growth. "Our 2013 marketing campaign was ‘A Whole New Blue’ and it truly is," said Dodgers Executive Vice President and Chief Marketing Officer Lon Rosen in a statement. "Our fans are back at Dodger Stadium and that extends across all social and digital platforms. We anticipate these numbers will continue to grow in 2014, thanks in part to the improved connectivity at Dodger Stadium." According to the team release, based on social interactions per post, the Dodgers ranked first in the Major Leagues in engagement per fan on Twitter, Facebook, Instagram and Tumblr during the 2013 season.